- 4 digits backlit LCD with maximum 1,000 counts. 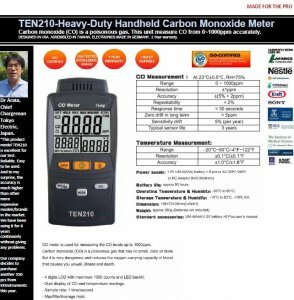 - Dual display of the readings for CO and Temperature. - CO range: 0 ~ 1,000ppm. - Temperature range: -20~50 ºC (-4~122 ºF). - Easy to calibrate at 100ppm or 500ppm. CO meter is used for measuring the CO levels to 1000ppm. Carbon monoxide (CO) is a poisonous gas that has no smell, color or taste. But it is very dangerous and reduces the oxygen-carrying capacity of blood that causes you unwell, illness and death. Maximum indoor air quality level. The average exposure level per U.S. OSHA workplace standards. The maximum average exposure of the U.S. OSHA workplace standards. evacuate people from enclosed space if the CO concentration exceeds 100 ppm per OSHA exposure limit. Headache occur in 2.5 hours to 3.5 hours. Headache, dizziness and will be dead within 2 hours. Headache, dizziness, vomiting and will be dead in 30 minutes. Headache, dizziness and will be dead within10 to 15 minutes. - Backlit 4 dgt LCD with maximum 1000 counts. - Sample rate: 1 time/second. Power supply : 1.5V UM-4(AAA) battery × 6 PCS or AC100~240V or DC Adaptor 9V/0.5A(9mm). Battery life: approx 90 hours. Storage Temperature & Humidity : -10°C to +50°C, <70% RH. Weight: approx 250g (Batteries not included).